The key to the walking school bus success lies in convincing the parents that little Johnny and Susie will be safe. Personally, I think the school bus is one of the toughest places for kids. The amount of bullying and teasing that takes place and that often goes undetected has been the subject of many studies. I’d rather take my chances walking. 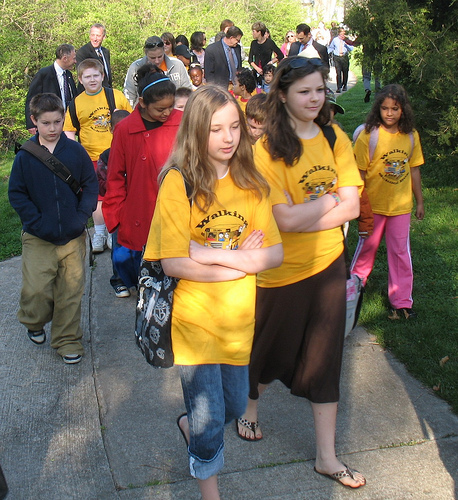 I think if more parents got out and really experienced what it felt like to walk to school, they would begin to push their elected officials for better infrastructure and connectivity. We need to start designing and re-designing our roadways and communities from the pedestrian perspective, not the automobile. Speaking of design, New York City’s Mayor Bloomberg announced two pieces of legislation (still awaiting City Council approval) that focus on promoting the use of stairs in public buildings and allowing stairways to remain open so that people could easily take the shorter trips by foot instead of elevator. I think this speaks volumes to the severity of the obesity epidemic. Arguably one of the most walkable cities in the world, where people are on the streets and sidewalks 24 hours a day is still affected by physical inactivity.